I was initially not a fan of this leg, as I am seriously tired of walking day after day after day, for all day. I have had to tape my knee up…again, as it is beginning to bother me a bit. My instep (same leg as knee issue) is bothering me as well…but Paul and I are a team, so…I walk. 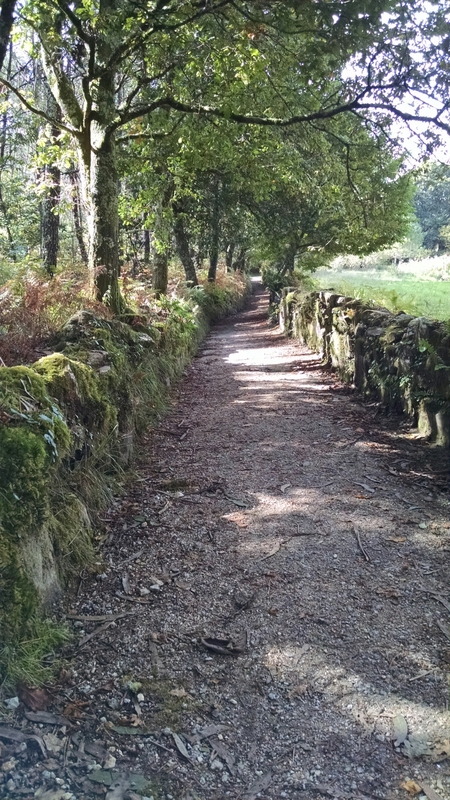 In some ways though I am looking forward to escaping the crowds and having the trail to ourselves, as not many actually decide to continue walking to Finisterre, and probably even less now with a credible threat of foul weather. We bid Sue, Jerry and Dave goodbye. 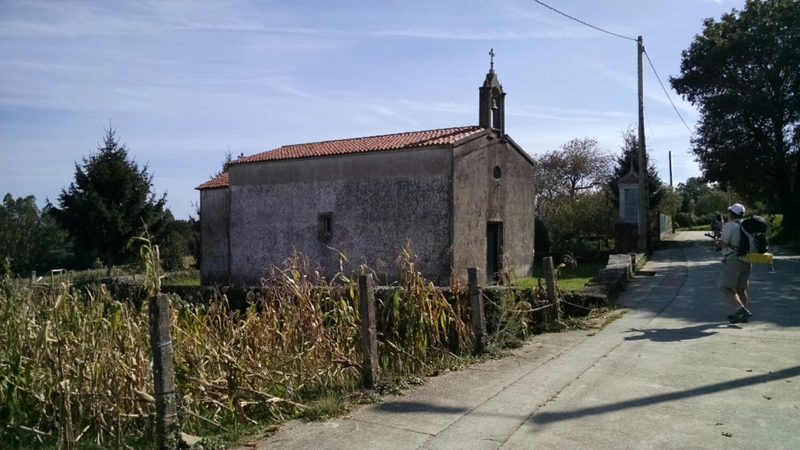 They are going to Finisterre as well, but on a bus. We on the other hand must do things the hard way. 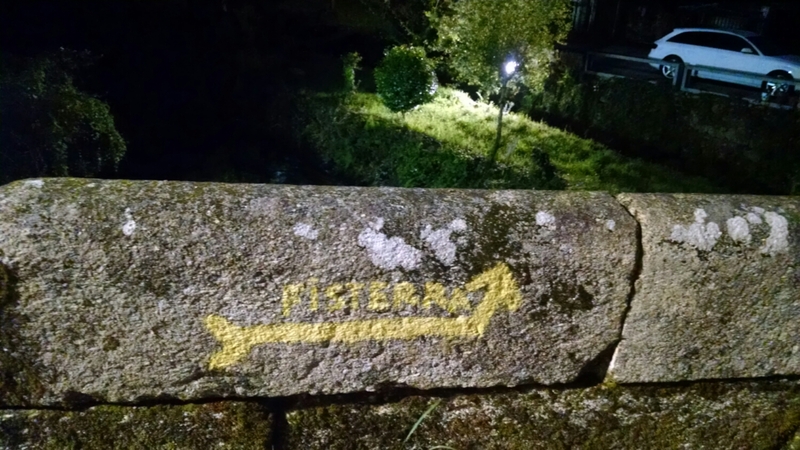 We will take three days to walk the 87km to Finisterre, with a serious rainstorm in the forecast. Today is supposed to be rain free with scattered showers Saturday and a deluge predicted for Sunday. We are hoping all this changes in our favor, and we are spared, but understand our optimism will most likely be tempered by reality. Nevertheless, this is not our first rodeo, so we walk and wonder what sights we will encounter today. We leave as day is breaking and walk out of the city of Santiago, that apparently had a party till 0400 this morning that could be heard from the top floor of our albergue. 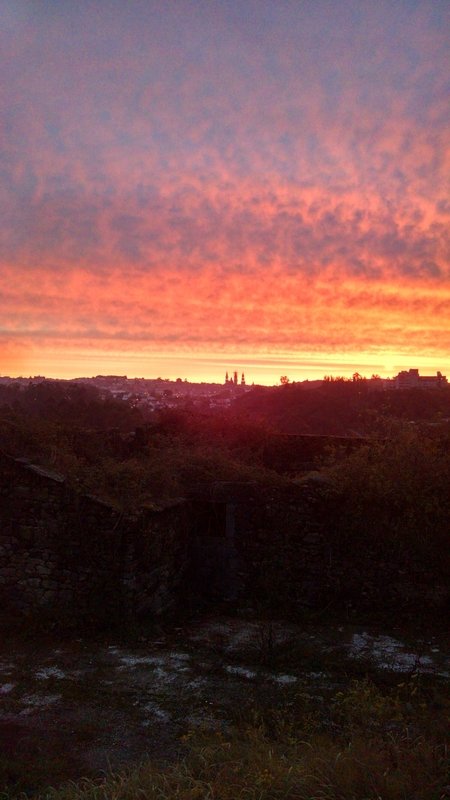 We turn back as we reach the suburbs of Santiago and catch the sunrise as it paints the skyline of Santiago, with the spires of the Cathedral outlined in brilliant pinks and reds. Our pictures (untouched or enhanced) from our phones can not do it justice. 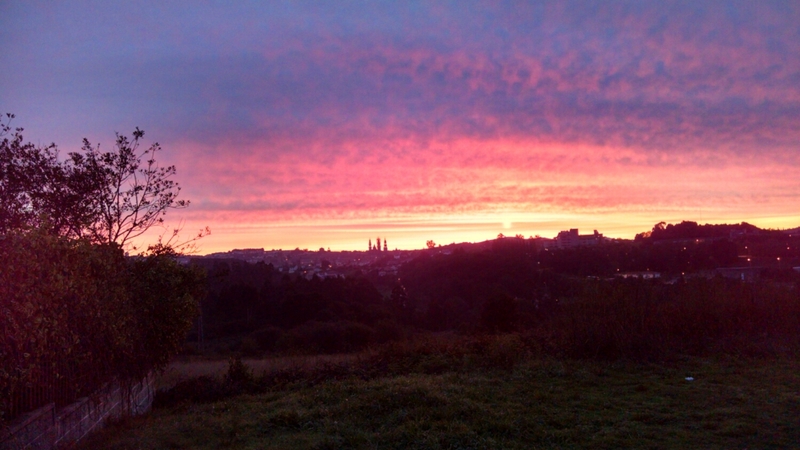 It was probably one of the most memorable sunrises of our collective lifetimes. We watch in awe as the colors morph with each passing minute. Eventually we pry ourselves away from this mezmorising sight and continue our trek. 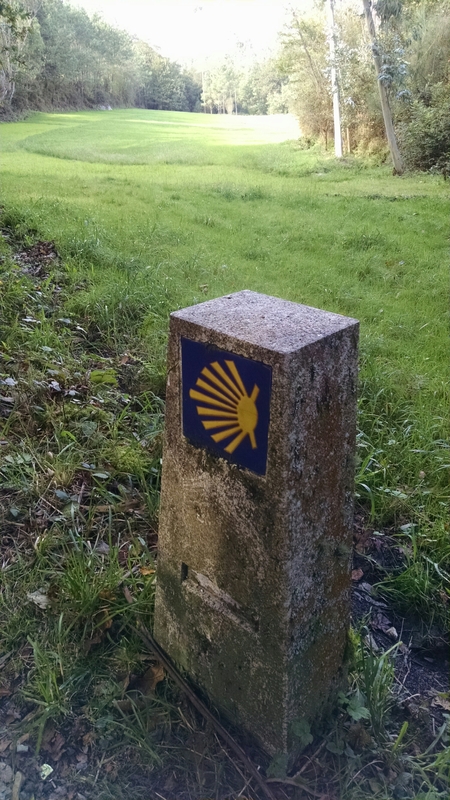 The goal is to get as far as we can, during this rain free day, before we run out of albergues or my foot gives out…which ever comes first. The tread is mostly “natural” with some climbs and rolling hills. We are mostly by ourselves, to our delight and surprise. The scenery is stunning. We both agree that this day is the best day we have had since we began our trek in St. Jean. Rich green fields, grazing dairy cows and scruffy men in coveralls driving tractors are our company for the day. 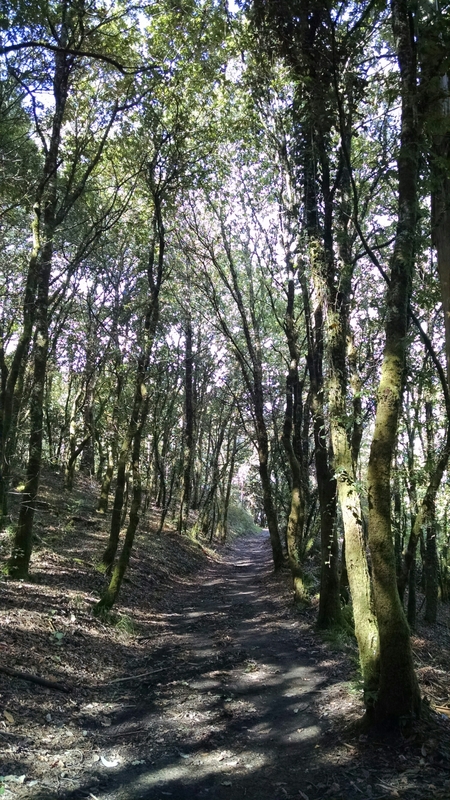 We walk through cooridors of moss and clover covered stone walls and under a canopy of oak and eucalyptus. 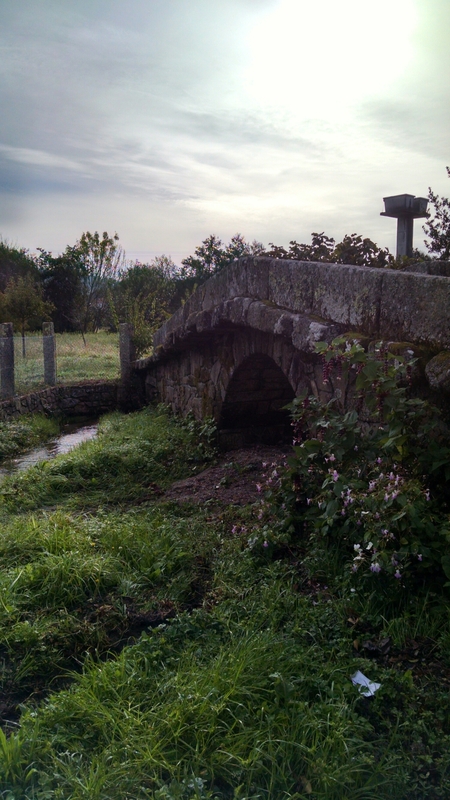 Early on we pass and ancient bridge for whose stream has left it. And walk over yet another whose river still runs through it. Cafés and bars are few and far between. Traffic is practically non-existant. 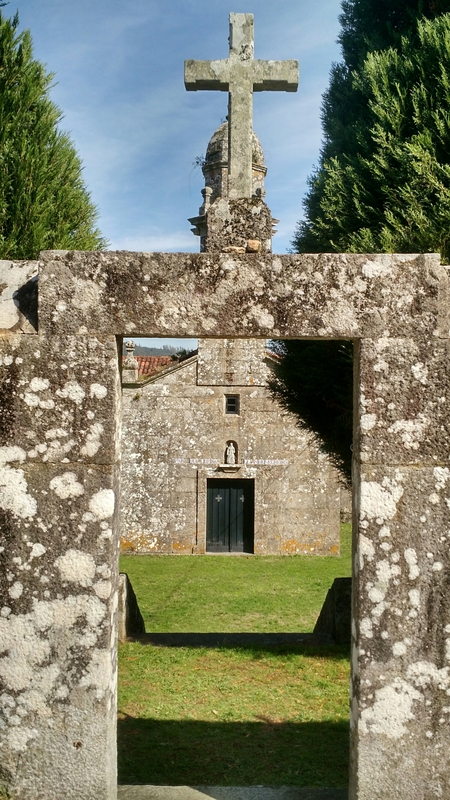 Churches and weathered crosses are not, but quietly bracket our path to Finisterre. 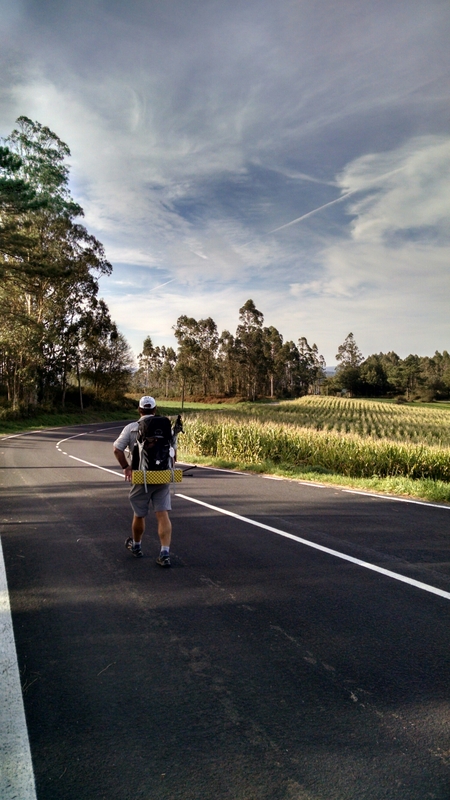 Fields of corn sway in a gentle breeze, which makes the bulk of the road walking more palatable. If rain were not forecasted for tomorrow morning we would have cowboy camped in one of the many soft fields of clover. 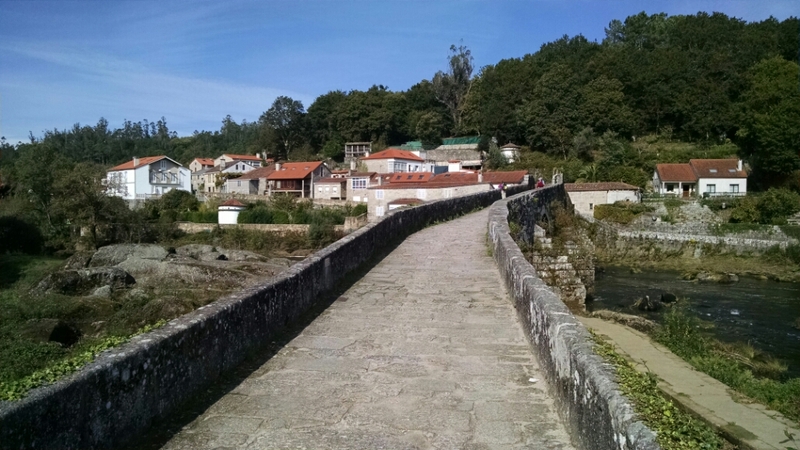 We descend into Vilaserio and check into the town’s private albergue and only bar/café. 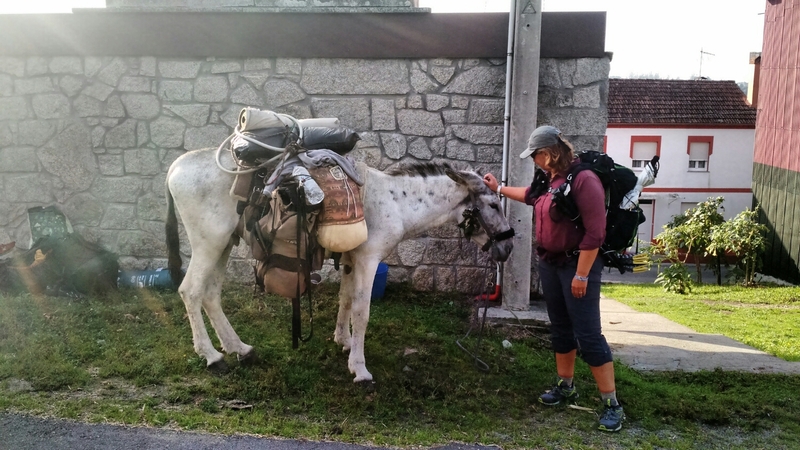 Outside the bar, a peregrino who is headed back from Finisterre, has “parked” his donkey. 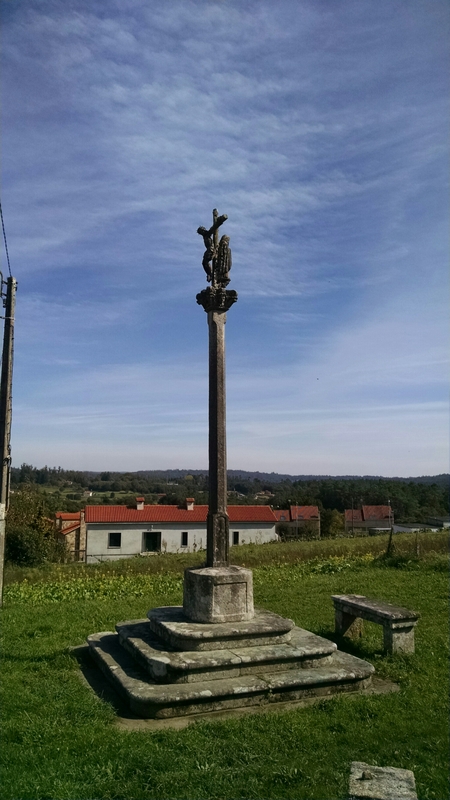 We dine with Joe from NY, and share stories of our travels since Palas de REI, and our plans once we are “done”. There is no mistaking that the threat of rain tomorrow looms over the vibe of the peregeinos dining at the bar. Exchanges are pleasant, but the vibe is somewhat somber. We all agree that this days travel and sights have been epic, yet we are all weary and not looking forward to the thought (or act) of slogging through another downpour. In the end, we will walk, regardless of the weather.